Humboldt will hit the road to take on a Mid-East League opponent for the second consecutive week when the Cubs travel to Riley County. Last week, the Cubs went on the road to Rossville and escaped with a 24-22 win to advance to the state semifinals for the first time in school history. After trailing 10-8 at halftime and 16-8 in the third quarter, Humboldt scored on a Conor Haviland touchdown run to tie the game at 16. Haviland then intercepted a Rossville pass and returned it inside the Bulldawg 20-yard line, setting up a Daegan Goodner touchdown on the next play. The Cubs then added the two-point conversion run to lead 24-16. Late in the third quarter, Rossville scored to pull within 24-22, but Humboldt stopped the two-point attempt. The two teams traded possessions in the fourth quarter without any scoring. Goodner, the undeniable team leader, led Humboldt with 115 yards rushing, while Haviland added 70 yards on the ground. The duo has been exceptional for a Cub offense that has averaged nearly 52 points per game. Goodner, the senior quarterback, has rushed for 1,100 yards and 20 touchdowns, while passing for 892 yards and 13 scores. Haviland, a junior, has rushed for 1,611 yards and 31 scores. Goodner is also the team’s leading tackler with 70 stops, while defensive end Tucker Hurst has been exceptional with 17 tackles for loss and seven sacks. While Humboldt has never before reached the state semifinals, Riley County is in the state semifinals for the first time since 1996. That’s also the last time the Falcons has defeated Silver Lake before last Friday. The Eagles looked like they were well on their way to their 25th state semifinal appearance as they led Riley County, 34-21 with two minutes remaining in the game. Riley County began a furious rally that started with a 66-yard touchdown pass from Garrett Harmison to Mikey Waggoner to cut the lead to 34-28. The Falcons then recovered an onside kick, and tied the game on a touchdown pass from Harmison to Nic Allen. Riley County lined up for the PAT to win the game, but it was blocked by Silver Lake to force overtime. Riley County scored on its first overtime possession on an 11-yard touchdown pass from Harmison to Wyatt Earhart, but this time the PAT missed wide right. Silver Lake’s possession ended as quarterback Mason Griffen hit Wyatt Heiman on a fourth-down pass, but he was tackled just short of the goal line to end the game. Harmison passed for four touchdowns, while Waggoner rushed for two scores and had the touchdown catch. On the season, Harmison has passed for nearly 1,800 yards and 23 touchdowns. Waggoner has put up back-to-back 1,000-yard rushing seasons with 1,020 yards and 17 scores. Senior Tristan Kulp has added 605 yards rushing and 12 scores for the Falcons. Harmison has spread the ball around to five different receivers that have double-digit catches on the season. Wyatt Earhart leads the team with 34 receptions for 531 yards and six scores, while Kulp ha added 32 catches for 426 yards and three scores. Earhart and Waggoner lead a Falcon defense that has given up 16 points per game. Earhart has 79 stops and 17 tackles for loss, while Waggoner has 69 tackles. Riley County’s only two losses on the season came to Silver Lake (31-12) and Southeast of Saline (23-21), both of which the Falcon’s avenged with playoff victories. The Cubs and Falcons only common opponent is Rossville. Riley County defeated the Bulldawgs 40-25 back in Week 4. This should be an outstanding contest with the winner advancing to Salina to play for the 2A state title. We’ll give a slight advantage to Riley County at home. This is a rematch from a Week 7 contest in Phillipsburg where the Panthers took advantage of some early turnovers and had multiple long touchdown plays. Phillipsburg led 27-0 at the end of the 41-0 at halftime and rolled to a 51-21 victory. Phillipsburg delivered 555 yards of total offense on just 50 plays. Phillipsburg earned a comeback road win, 25-24, versus Conway Springs last week. Hoisington defeated ranked Hutchinson Trinity, 30-0. Since the Phillipsburg loss, Hoisington has had several improvements. Senior Xavier Robinson has become an explosive complement to junior Wyatt Pedigo, and sophomore Mason Haxton has returned from injury and become a bigger part of the offense. Robinson has 68 carries for 732 yards and 10 scores, his only rushing touchdowns of his career. Since the Phillipsburg loss, he has his two highest carry performances. In the last six games, he has 100 or more yards three times and eight TDs. Haxton, the starting quarterback as a freshman a year ago, suffered injury in Week 1. He returned after Phillipsburg as a ball carrier and has 18 carries for 141 yards and a score. Pedigo rushed for 142 yards versus the Panthers and lost a fumble – the last time he has had a turnover this fall. He has delivered an exceptional year with 194 carries for 1,959 yards and 28 scores, along with 94 tackles and nine TFLs at linebacker. Hoisington has matched the 2016 season for the best finish in school annals. The Cardinals are 0-4 versus Phillipsburg since 2012 with all losses by at least 21 points. Last season, Phillipsburg beat Hoisington, 35-6, in the playoffs. Phillipsburg has advanced to one state game in school history. In 2015, Phillipsburg went 11-2 and won the 2-1A state title. Phillipsburg went 23-2 the last two seasons with losses in the 3A quarterfinals and 3A semifinals. The precedent for playing Phillipsburg much closer in a rematch comes from Hoisington’s fellow Central Kansas League squad, Larned, in 2016. That year, Phillipsburg defeated Larned, 50-0, in Week 6 on the road. In the second round of the playoffs, a healthier Larned squad sustained long drives, took advantage of Phillipsburg miscues and had the chance late to win or tie. Phillipsburg won 14-7, at Larned. A huge key for Hoisington is maintaining with Phillipsburg early. The Panthers have often led by big margins after the first quarter, including quality foes Smith Center, Lakin, Ellsworth and Norton. In those four games and the first Hoisington contest, Phillipsburg collectively led 110-0 after the first quarter. Last season, Phillipsburg did not allow a point in the first quarter all season until the semifinal loss to Marysville. Last week, Phillipsburg trailed Conway Springs the majority of the game, and Conway, led by its rushing attack, outgained the Panthers. Phillipsburg finished with 294 total yards, including 243 rushing and 51 passing. Senior quarterback Trey Sides, a four-year starter, accounted for 96 total yards, and senior running back Treylan Gross had 18 carries for 88 yards and two TDs. The Panthers also received another big game from standout kicker Jonathan Hunnacutt, the state’s all-time leader in career kicking points. Sides didn’t get an opportunity to play in the semifinals last year because of injury. This fall, he has delivered another exceptional year and will finish his career as one of the all-time winningest quarterbacks in Kansas annals. The Panthers have plenty of depth with senior running back Cha’Ron Ellis, and senior linemen Kasen Keeten and Jaret Shelton. Hoisington, like Larned two years ago, should give Phillipsburg a much more competitive contest and as the running attack to match the Panthers. Similar to last week versus Conway Springs, Phillipsburg has definite edges at quarterback and special teams and is the favorite. Two programs with a lot of respect for one another will meet in the sub-state semifinal for the second consecutive season. In their history, St. Mary’s Colgan and Olpe have played some great battles on the football field and on the basketball court in the state playoffs. Friday’s meeting will be third consecutive year the Panthers and Eagles have met in the playoffs and will be the 11th overall meeting. Colgan holds an overall 8-2 advantage. The two teams have met in the sub-state semifinals three times in the last ten years. 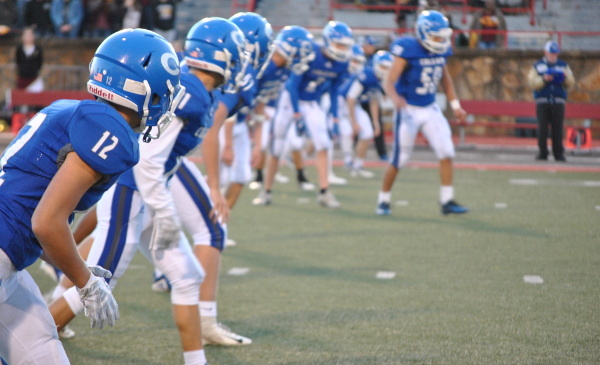 Colgan won last year’s meeting 15-12, and won 35-24 at Olpe in 2010. Olpe won the 2008 meeting at home, 20-0. Both teams will be without their top players due to injury. Olpe has been without senior running back/linebacker Blaine Hinrichs (6-0, 200) for a few weeks due to a season-ending injury. Hinrichs, a Kpreps all-state selection as a running back last fall, had rushed for 755 yards and 17 touchdowns this season before being sidelined. Colgan played the first two rounds of the playoffs minus 4-5 starters due to various injuries. Last week, the Panthers returned to near full health despite missing senior fullback/defensive end Matthew Lomshek (6-1, 200) who was lost for the season in the final game of the regular season. The Panthers were then dealt another big blow towards the end of last week’s 34-7 win over Jackson Heights when senior quarterback Cade Simmons (6-0, 200) went down with a season-ending knee injury. Simmons is Colgan’s statistical leader on offense this season with 1,036 rushing yards and 18 touchdowns. He also passed for 913 yards and 14 scores. Simmons had a hand in all five touchdowns in the Panthers win over the Cobras last week. In the past couple of weeks, Colgan has had numerous players step up and admirably fill the role of those who have been out. Senior Conor Price made the transition to fullback in the last two weeks despite never playing the position in his high school career and having been used very little on offense. Price has delivered more than 230 rushing yards and three scores since the transition. While the Panther offense may experience some uncertainty, the Colgan defense has been solid in allowing only 10 points per game this season. Last week, the Panthers held Jackson Heights’ 1500-yard rushing Cooper Williams to 39 yards on 16 attempts. Olpe has been even more stingy on the defensive side of the ball in allowing only 70 points all season, or less than seven points per game. The Eagles have given up double-digit points only twice this season – both coming in wins over Jackson Heights and Centralia by identical scores of 20-18. In last week’s win at Centralia, Olpe took advantage of a fumble on the second-half kickoff to break a 6-6 tie on a 1-yard touchdown run by quarterback Colby Hoelting on fourth-and-goal. Olpe intercepted Centralia on the ensuing Panther possession and the Eagles eventually scored on the second touchdown pass of the game from Hoelting to Dawson McCarthy to take a 20-6 lead. Centralia scored twice late in the fourth quarter, but the Eagles stuffed the Panthers’ two-point conversion attempt to tie then recovered the ensuing onside kick. Hoelting passed for 80 yards and two touchdowns to McCarthy who had 65 yards receiving. For the season Hoelting has passed for 872 yards and 14 scores. Sophmore Kynden Robert led the Olpe ground game last week with 60 yards rushing to push his season total to 1,011 yards with nine touchdowns. Colgan has been playing their best football of the season of late, but without Simmons and Lomshek, the Panthers will be missing nearly 60 percent of their offensive production. That may be too much to overcome on the road against the second-ranked Eagles. For the third straight fall, Mid-Continent League foes Plainville and Smith Center match up in the regular season and again in sub-state. In 2016, Plainville won 20-16 in Week 1 and 14-0 in the sub-state title. Plainville earned 2-1A runner-up to Troy. Last year, both contests occurred in Smith Center. The Redmen earned a 16-7 victory in the season opener, and then defeated Plainville, 51-0, in sub-state. It marked the Redmen’s second-closest game of the last seven 2017 contests as Smith Center went 12-1, rolled to the 2-1A title and had one of the most dominating statistical seasons in 2-1A history. This year, the teams have many commonalities. Both fell by 28 points early to Phillipsburg. Each team won in the final seconds versus Ell-Saline in late season. Smith Center beat Ell-Saline, 15-8, and Plainville won on a last-second field goal, 31-28. In the regular season contest, Smith Center came back and defeated Plainville, 21-10. After a Smith Center turnover yielded a short field and Cardinal touchdown, Plainville had a 10-7 lead for most of the second half as the Redmen embarked on a memorable 22-play, 80-yard drive that ended with 7:52 remaining in the contest. Senior Hesston Maxwell scored on a 1-yard run. Then, Plainville drove into Smith Center territory before a turnover on downs. Ethan Peterson added a late long touchdown run as the game was much closer than the final score. In the last two seasons, Smith Center is 22-0 when not playing Phillipsburg, 0-2 against the Panthers. At home at Hubbard Stadium, Smith Center has not lost to a non-Phillipsburg team since a 36-14 Week 2 loss to Beloit in 2013. Plainville has virtually been the same team offensively as last year. The Cardinals averaged 6.22 yards per play in 2017, and 6.29 yards per play this fall. Junior quarterback Jordan Finnesy and junior fullback Jared Casey again pace the Cardinal offense. Smith Center averaged 9.7 yards per play last year and 7.9 yards per play this season. Smith Center has thrown just 41 passes, Plainville 191. The Cardinals have 12 turnovers but are plus-17 in turnover margin. Smith Center has committed just five turnovers all year and stand plus-21. The Redmen have slight overall edges in scoring offense/defense. Smith Center stands at 441-102 with the classification’s second-best offense and defense. Plainville is at 374-140. Smith Center has 39 players, while Plainville has just 24. The Cardinals have eight seniors and freshman lineman Ben Hansen has started. Finnesy, who struggled with some decision making in the first Smith Center game, has thrown for 1,444 yards and 18 scores, and rushed for 921 yards and 12 TDs. He could finish with his second straight 1,000/1,000 season. Casey rushed for 915 yards and 14 TDs, and has 21 catches for 324 yards and three scores. Plainville has a host of talented receivers and had multiple acrobatic catches on receptions and interceptions in last week’s win against Elkhart from senior Brandon Rohr, junior Cody Crawford and by Finnesy on defense. Defensively, senior Kobe Spiess has enjoyed a solid year with 13 TFLs, 27 catches for 413 yards and six scores, all team-bests. Senior Tanner Copeland is one of the state’s best kickers with eight field goals and 42 of 44 on extra points. Smith Center counters with its stable of running backs and veteran line. Peterson has delivered 1,147 yards and 15 TDs, senior Colby Benoit has 1,043 yards and 20 scores, and Maxwell has 528 yards with five TDs. Senior Austin Hobelmann and junior Joel Montgomery have anchored the lines. Senior Logan Zabel leads with 124 tackles. Smith Center has slight edges at multiple position groups, notably on the lines and at running back. Plainville has the better passing offense and holds the edge on special teams. The formula was likely set in the first matchup for Plainville – winning on special teams, a key turnover and passing the ball effectively. However, the edge goes to Smith Center with its depth, line and playing at home.